Gain the knowledge, skills, and abilities to accurately identify and treat your most difficult personality disordered clients! Join national trainer and author, Dr. Daniel J. Fox, as he delivers an intensive recording designed to provide you with the knowledge, skills, and abilities to accurately identify and treat your most difficult personality disordered clients. 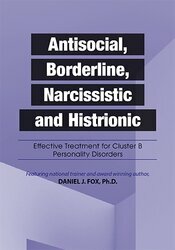 Better understand your clients with Antisocial, Narcissist, Histrionic and Borderline Personality Disorder client and make a breakthrough in clinical treatment. Manage the manipulative and possibly violent Antisocial Personality Disorder in-session. Overcome the Narcissistic Personality Disorder trait of perfectionism and combat their need to overpower you as the therapist. Better understand your clients diagnosed with Histrionic Personality Disorder whose intense emotions and need for attention will test your patience and compassion. Help the Borderline Personality Disorder client deal with their explosive emotions, self-harm tendencies and cravings for chaos. Case studies and video examples will be used to illustrate client symptom presentation, treatment, and management of each Cluster B client type. You will explore various modalities that are effective with antisocial, narcissistic, histrionic, and borderline personality disorders, such as Motivational Interviewing, Cognitive-Behavioral, Interpersonal, and Dialectical therapies. Each of these theories will be explored to provide you with solid and useable skills to include in your daily practice. Stop being stuck and frustrated with your Cluster B Personality Disorder clients! Get this recording today! Determine how the changes with the DSM-5® impacts diagnosis and treatment of the Cluster B Personality Disorders. Identify and diagnose clients with antisocial, narcissistic, histrionic and borderline Personality Disorders to effectively inform your choice of treatment interventions. Utilize case studies to differentiate symptom overlap, effective treatment and emotional management of each Cluster B Personality Disorders client type. Manage the manipulative and potentially violent behaviors with your clients diagnosed with Antisocial Personality Disorder in session to make therapeutic progress. Implement CBT techniques to clarify behaviors, values and goals with clients diagnosed with Narcissistic Personality Disorder. Incorporate techniques to decrease explosive emotions, self-harm tendencies and cravings for chaos for clients diagnosed with Borderline Personality Disorder. Utilize MI and DBT techniques with clients diagnosed with Histrionic Personality Disorder to help manage cognition and improve emotional regulation. Please Note: PESI is not affiliated or associated with Marsha M. Linehan, PhD, ABPP, or her organizations. Daniel J. Fox, Ph.D., has been treating and specializing in the treatment and assessment of individuals with personality disorders for the last 14 years in the state and federal prison system, universities, and in private practice. He is a licensed psychologist in the state of Texas and has published several articles on personality, ethics, and neurofeedback. He is the author of The Clinician’s Guide to Diagnosis and Treatment of Personality Disorders (PESI, 2013), Antisocial, Borderline, Narcissistic and Histrionic Workbook (PESI, 2015) and Narcissistic Personality Disorder Toolbox (PESI, 2018). His specialty areas include personality disorders, ethics, and emotional intelligence. Dr. Fox has been teaching and supervising students for the last 13 years at various universities across the country, some of which include West Virginia University, Texas A&M University, University of Houston, Sam Houston State University, and Florida State University. He is a staff psychologist at the Federal Detention Center in Houston, Texas, adjunct assistant professor at University of Houston, as well as maintaining a private practice that specializes in working with difficult clients. Dr. Fox has given numerous workshops and seminars on ethics and personality disorders, personality disorders and crime, emotional intelligence, managing mental health within the prison system, and others. This self-study course has been approved by PESI, Inc., as a NAADAC Approved Education Provider, for 6.0 CE in the Counseling Service skill group. NAADAC Provider #77553. PESI, Inc. is responsible for all aspects of their programming. Full attendance is required; no partial credit will be awarded for partial attendance. Nurses completing these self-study materials will earn 6.3 contact hours. Expires: 3/15/2022. PESI, Inc. designates this self-study activity for a maximum of 6.0 AMA PRA Category 1 Credit(s)™. This activity was originally recorded on 03/15/2019. It was last reviewed on 11/10/2018 and is valid until 11/10/2021.